Edith LaVonne Demaray was born on March 18, 1933 in Jewell, Iowa to Charley and Ida (Stout) DeLozier. After attending eight years of country school, she graduated from Jewell High School as Valedictorian in 1950. Edie lived in Story City since 1954, and was a member of Bethel Lutheran Church. In 1993, she retired from ISU Credit Union after working there 25 years. Edie was an active volunteer in her church, as well as Retired Senior Volunteer Program (RSVP), delivering Meals on Wheels, mending for the Bethany Manor residents for seven years, as well as helping many elderlies on a regular basis. 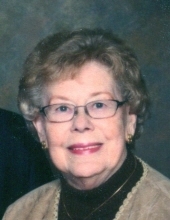 Her greatest joy was her family; husband, children, grandchildren and great-grandchildren and attending many of their school and sporting activities. Edie passed away September 10, 2018 at Israel Family Hospice House in Ames at the age of 85. Edie is survived by her loving husband of 46 years, Gene, and children, Rick Tjernagel (Marlene) and Lori Prachar of Story City, Deb Davidson, Gail Wyatt (Kevin) of Omaha, NE, Dean Demaray and Douglas Demaray of Austin, TX; nine grandchildren, Grant (Megan) Tjernagel, Blake Tjernagel, Tara (James) York, Trish (Ron) Zarachi, Mackenzie Wyatt, Parker Wyatt, Jeremy Demaray, Briana Demaray, and Jessica (A.J.) Smith; six great grandchildren, Alex and Rylie Sorenson, Aiden York, Anja and Jett Tjernagel and Joszyln Smith; a sister, Helen Johnson; a sister-in-law, Margery Demaray and a brother-inlaw, Leighton Demaray. Edi was preceded in death by her parents; a great granddaughter, Jazmine Sullivan; a sister, Ruth Satre and brothers-n law, Ardis Johnson, George Satre, Irwin Demaray and Virden Demaray. Memorials may be made to Bethel Lutheran Church or Israel Family Hospice House. To send flowers or a remembrance gift to the family of Edith LaVonne Demaray, please visit our Tribute Store. "Email Address" would like to share the life celebration of Edith LaVonne Demaray. Click on the "link" to go to share a favorite memory or leave a condolence message for the family.